The Sport towel I am trying is the 20 x 40 - Hand and Face Towel. It is nice and light, honestly I wasn't sure this baby could handle much it is so light. It did the trick, wiping up my sweat and maybe a spilled water bottle (working out with kids running around can be messy)! Impressive considering it's little size. I like that it is fashionable, mine is Blue with Green Stitching. If you know me this is not a surprise as I love the color Blue. They come in other colors too, so those fashion sensitive health mama's don't have to worry about clashing! You could use the Youphoria Multi-Sport towel to backpack and hike, wipe off after an intense Cross-fit workout, dry and hold up your hair after taking your daily shower, at beach, Pilates and Yoga classes to stay dry and reduce slipping on top of your yoga mat, kayak and rafting, or at a music festival or local outdoor concert dancing those pounds away. Whatever your fat melting activity of choice this thing seems like it would be a great fit to that work out bag. The only thing I could think of wanting really is less restrictions on the washing, but other than that it seems to be a great fit for your sweat! — MACHINE WASH with COLD water on EASY. — AIR DRY FLAT is recommended. For faster drying TUMBLE DRY on LOW. 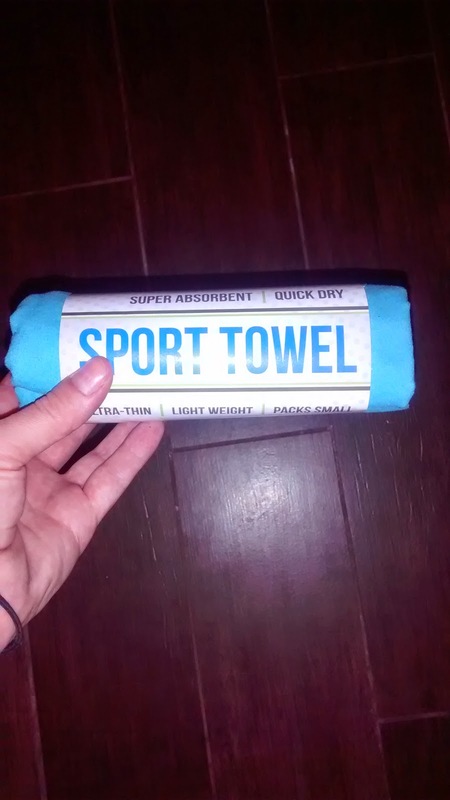 This towel is a sport towel/travel towel we offer 3 sizes. - LIGHT WEIGHT AND COMPACT DESIGN: Weighing less than 150 grams - that's less than your average fruit weighs - the Youphoria Multi-Sport Travel Towel is 50% lighter than leading cotton alternatives. The compact design enables you to pack and take it anywhere! - UNIQUE STAY-DRY TECHNOLOGY: Our towels are 100% microfiber, which dries tremendously faster than the leading alternatives. Microfiber can hold up to 4X its weight in water but dries 5X faster than normal cotton towel, and it will even dry quickly when you have it folded up or stored in your bag. Microfiber is designed specifically for this use. Ultra-soft, Super-Absorbent, Ready to go! - CONVENIENT HOOK: No one likes a towel on the floor and often times if you hang dry you towel it's not able to get the air it needs to dry quickly! Other towels either have a very small hook that isn't really that useful or are missing the hook altogether. We've re-developed our hook to be very practical and work in a variety of situations. Be confident that you'll never have to throw over rail or lay on the ground. - TOUCH: Tired of itchy towels? Yup, we were too. That's why we decided to use a 100% microfiber towel with a high thread count, the result is an ultra-soft, super-durable, and pleasantly enjoyable towel that you will love. Owning a towel that is enormously practical, comfortable, and in a fashionable color is important. We urge you to get your first towel today.